Congratulations to Dr. Filar on achieving the status of “Diplomate, American Board of Optometry”! This noteworthy professional accomplishment was achieved by passing a rigorous boards test based on high standards of knowledge and clinical skill. 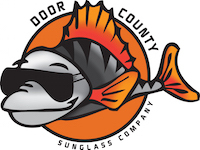 See Door County better at our sunglass specialty store, the Door County Sunglass Company on Highway 42 in Egg Harbor! We carry top brands, including Oakley, Maui Jim, Ray Ban, Nike, Smith Optics, Costa, Kate Spade, and Vera Bradley. Click on the fish below to learn more!